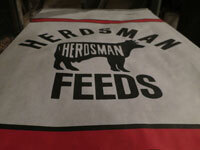 Welcome to Herdsman Feeds. We are a 2nd generation family-owned company headquartered in Western Wisconsin. The company was founded in 1974 and has operated continually right up to today. In the 43 years since the company began, many things have changed; a bigger building, new equipment, more employees. But our goals have always remained the same: "provide high quality products & service at a cost effective price." Herdsman Feeds was there when 40-cow herds dotted the Wisconsin landscape. Today, with 1000-cow dairy herds a common sight, we're still here... still family owned... still the same goals... still the same values. Check out our website to learn more about us. Give us a call or stop by for a visit. You are always welcome. 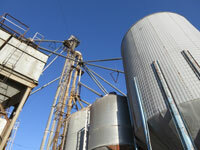 Our bulk commodities save you money. Our in-house "Charlie's Farm Store" has got you covered. 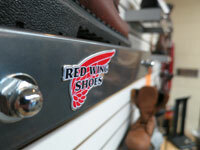 Stop in for Red Wing Boots, Muck Boots, Carhartt Clothing, and a full line of supplies. We manufacture a full line of feeds in bag or bulk for animals of all ages. Dairy, Beef, Horses, Chickens, Sheep, Hogs, Meat Goats, and Lactating Goats as well as many species of Exotics. We stock 15 different commodities. If you’re looking for proteins with mysterious names, you won’t find it here. We don’t name our proteins. If you want to buy Ol’ Bag-Buster 40 or Go-Gettum 38, you’ll have to buy it from our competitors. Our great advantage (and your great benefit) is our ability to develop "least cost" protein blends that are specially blended to fit your operation (based on your forage tests and your performance goals). Custom blended commodities are the best way for you to buy protein. In addition to the more common commodities such as 46% Soybean Meal, Distillers, Roasted, Shelled Corn, Oats etc, we also carry some less common, but cost-effective, commodities such as (all pork) meat meal, (all pork) blood meal, as well as Hormel (all pork) liquid fat. Because we stock a wide variety of ingredients, you will receive a more cost effective "least cost" ration! Contact us for your free forage tests and "least cost" ration and commodity blend. Or have us bid on the protein mix you’re using now. Analysis are precise, fast and free. We test your feeds every three weeks. More often if needed, there is never any charge. Herdsman Feeds owns and operates its own "in house" NIR forage testing lab. We offer unlimited free testing to all Herdsman Feeds customers. Because we own the lab (since 1987) we don't have to pay $10.00 or $12.00 each to an NIR lab for your free forage tests and then load the cost into your feed. Our testing really is FREE. Our specialists provide regular "on farm" consultation. Contract ahead to lock in the price of your grains and proteins. We roast soybeans, corn and other ingredients. Call for details. Each time we test your feeds, you will receive a ration that is tailor made to help give you cost-effective production. We use "least cost" computer ration balancing software. We first enter the results of your feed tests into the computer. Our software will then use your feeds and it will also choose from our 15 different commodities to come up with the "least cost" way to provide the required diet for your herd. It is not unusual for a "least cost" computer program to choose 7 to 12 different commodities for a protein blend. That is why it's important to work with a feed company that offers a broad range of commodities to achieve a true "least cost" ration. Our bulk ingredients save you money. Herdsman Feeds is fully equipped to manufacture mineral and vitamin pre-mixes. We buy our ingredients in full semi loads to get the lowest possible price. We manufacture a full line of standard products. We also custom blend to your specifications. If you prefer your present formula, we'll match the tag and give you a bid on it. Either way, you'll get "factory direct" prices to save you money. If your operation is more than 100 miles from our plant you should expect to take a full load (21 tons) to keep your costs down. We can split loads into 4 batches. This means that you and 3 neighbors could each take 5 tons and fill the truck. Don't let the distance scare you. We haul feed to South Dakota and after the freight charges are paid, the customer still saves up to $45.00 per ton on his protein mix. What's the difference how much the freight costs as long as you've saved money when the finished product is in your bin. Yes. We can store your grain. Call for details. Corn drying available. Call for details.